We are often told to simplify our businesses; however, how we go about implementing this strategy can result in a new level of complexity and cost to your organisation. I was recently working with a company that continuously aggregated work over a couple of years to a single supplier. The business was continuously looking for efficiency improvements and “Supplier Overheads” were a visible target. Initially, this provided some efficiencies but as time went on, it became less clear what the supplier was doing on a day-to-day basis and monthly invoices were difficult to reconcile. Furthermore, requesting changes to one part of the outsourced agreement seemed to just push cost into another part. When it came to the end of the initial contract term, the supply team was tasked to “market test” the scope as part of the corporate governance policy. It quickly became apparent that the components of the agreement were so intertwined that it would take months to truly understand the total cost of ownership of each of the activities and properly scope each component. Therefore, it became too difficult for the team and the task didn’t happen, resulting in the whole agreement being tendered. It wasn’t until after several contract extensions and a new manager, that frustrations (of not being able to truly understand the underlying costs) boiled to the surface. We ended up fixing the problem and achieving a 50% cost reduction. 1) If Economies of Scope and Scale cannot be confidently articulated, they were probably eroded years ago. 2) Continuously aggregating work to a single supplier is like doing your weekly shop at 7 Eleven – Convenient but expensive. 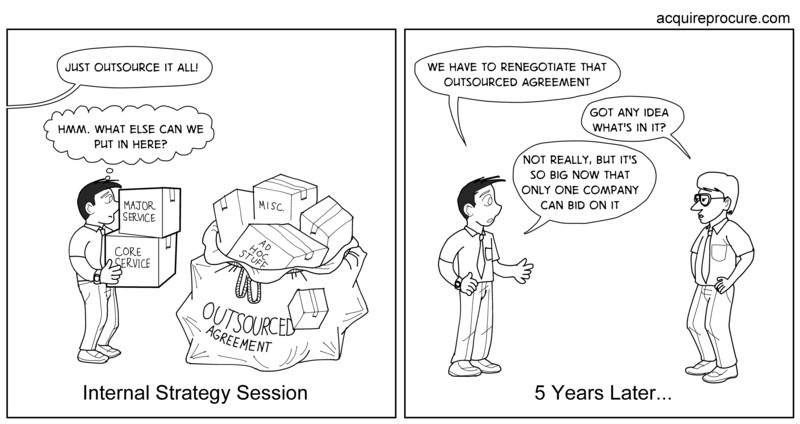 3) Before creating large aggregated outsourced agreements, think about who can possibly provide that package and if their businesses are designed to deliver efficiencies from the larger scope. 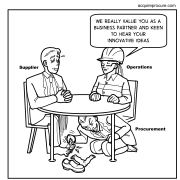 Is Procurement working in a silo from your Business Operations? Do you have the right procurement support to deliver your strategy? Are your major services contracts strangling your business? Is your service contract not getting the results you want? 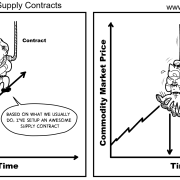 Contract theory may help! Would you pay $20k for Brent “Boomer” Harvey? F1 Team Costs – A Visual Breakdown Do you have the right procurement support to deliver your strategy?